Although the Los Angeles Police Department was in its infancy, the City fathers saw a need to oversee the operations of the tiny department. Citing concerns over celebratory fireworks and the potential for disaster in a clapboard city center, the Common Council of the City of Los Angeles voted to create the Los Angeles Police Commission on December 31, 1870. The concerns about fires and general lawlessness were indeed real. But, this was also a time where great concerns were voiced about the killing of the City Marshal by one of his deputies. Regardless of motivation, the Police Commission was formed, and remains intact to this day. Initially, one of the Commission’s primary concerns was the handling of the personnel matters of the police department, hiring and firing and the like. The duties of today’s Commission are more wide ranging and varied. Chief among these is the selection of the Chief of Police. The Commission also issues permits to various types of businesses that require police oversight. Enterprises like private security patrols, tow trucks, massage parlors and dance halls all require permits from the Commission. From time to time, the Police Commission has conducted independent inquiries. Most of these involved headline events or major investigations that occurred in the City. The 1956 wreck of a Santa Fe freight train was investigated, as was the 1968 assassination of Senator Robert F. Kennedy. Inquiries into the officer-involved shooting of Eulia Love and the shootout with the Symbionese Liberation Army were also made by the Police Commission. The Department’s highest honor, the Medal of Valor, is awarded by the Commission. First awarded in 1925, the original MOV was a copper award featuring an enameled city seal in the center. This design has given way to the antiqued silver model that is suspended from the blue and white ribbon, and presented to today’s heroes. Much of what the Commission does, and has done, occurs in public meetings. Presently the meetings are held in the commission meeting room on the ground floor of Parker Center. Previous to the construction of the current Police Administration Building, meetings were held in City Hall. 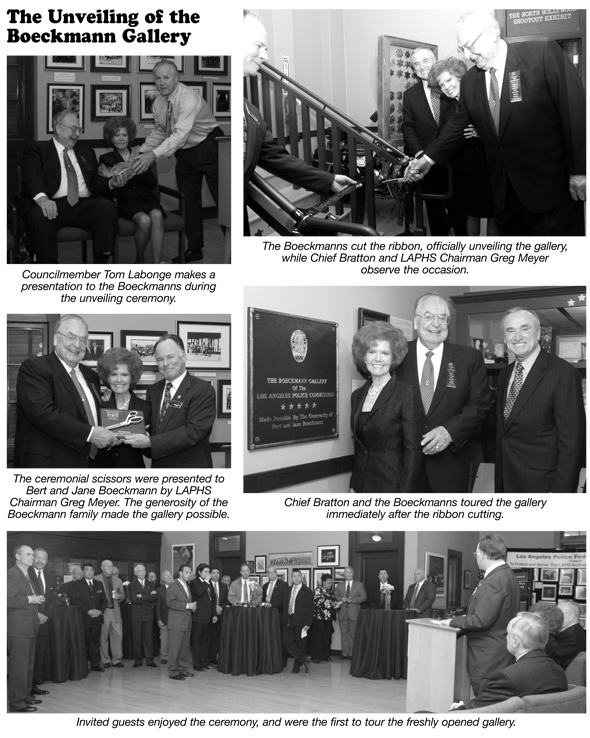 Bert and Jane Boeckmann were joined by current and former Police Commissioners for the unveiling of the Boeckmann Gallery of the Los Angeles Police Commission. 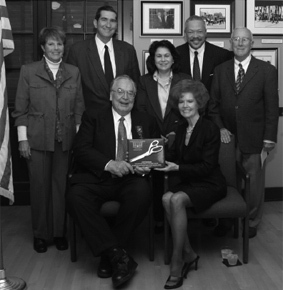 Standing behind the Boeckmann’s are former Commissioner Ann Reiss Lane, current Commissioner Alan Skobin, and former Commissioners Edith Perez, David S. Cunningham III and Frank Hathaway. Commission. Body armor, ballistic inserts for police car doors are two very specific methods of protection, and each of these was a result of Commission action. The deployment of rifles and shotguns in police cars resulted from Commission decisions. So, too did the change to semi-automatic handguns. Since 1925, the Police Commission has been comprised of citizens who are selected by the Mayor and approved by the city council. Commissioners serve largely as volunteers, receiving only a small stipend for attending meetings. The current Commission has an executive director to oversee the paid staff. The office of the Inspector General also reports to the Commission. These are two significant and recent changes to the organization of the Police Commission, but no change was bigger than the overall modification of the City’s commission system experienced during the twenties. Previously, the Police Commission was composed of the Chief of Police, the Mayor and the Chairman of the City Council’s Committee on Police. The transition to a commission of five mayoral appointees has been in place for more than eighty years now, and is indeed a key element of this body’s history. 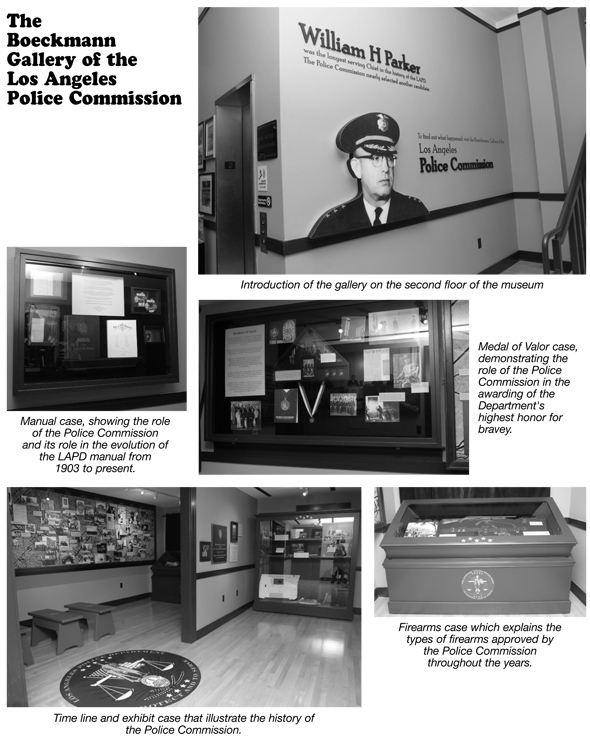 It is a history proudly displayed at the Historical Society museum in the recently unveiled Boeckmann Gallery of the Los Angeles Police Commission. More pictures from the gallery and the unveiling ceremony follow. In the coming days, revelers will be welcoming the New Year with a bang. Celebratory fireworks, and knowing the local neighborhoods, some unwelcomed gunfire, will also greet the New Year. Just as 2009 will ring in with all kinds of celebrations, the Historical Society’s 2008 closed out with a very meaningful celebration. We shared the history of the Police Commission on our cover for a simple reason. Its formation was attributed to the hazards of the anticipated New Year’s revelry and horseplay with fireworks. Early Los Angeles, a clapboard town, was longing for some semblance of protection from the aerial incendiaries. Although the Historical Society did not feature a fireworks spectacular, we did end our year with the unveiling ceremony of the Boeckmann Gallery of the Los Angeles Police Commission. The ceremony featured Chief Bratton and Councilman Tom Labonge addressing some of the history of the Department and its executive body. Chief Bratton joined Bert and Jane Boeckmann with the cutting of the ribbon, officially opening the exhibit. This gallery was professionally executed by a local graphics firm and showcases the many and diverse roles the Police Commission plays here in the City of Los Angeles. A video narrated by the Chief helps explain the role of the Commission and ties its activities to the artifacts displayed in the Gallery. Our first visitors have greatly enjoyed the multimedia experience the Boeckmann Gallery has brought to the museum. We, of course, are fortunate to have the exhibit, and extend our thanks to the Boeckmanns for their patience and generosity. We also thank former Commissioner Frank Hathaway for the loan of artifacts that are now on display, and Keith Bushey for the use of his historical badge collection on the evening of the unveiling. The photos on the following pages tell more about the gallery and the event. covered Academy and its surroundings. The film was shot from an aircraft, given that this was 7 years before LAPD used helicopters, it appears to have been a low-flying fixed wing. Truly unique footage from some unusual weather in the City of Angels. The reel is presently out for a digital transfer, a process that simultaneously will preserve the film and make it more useful. 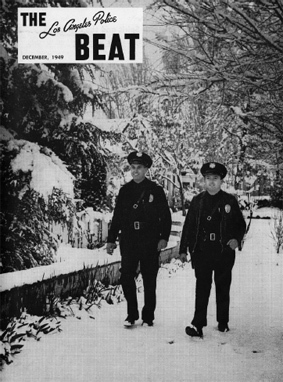 The same is also going on with the Beat magazines, presently, we are integrating some newly donated issues of the Beat to our current collection. One of our talented volunteers, Alan Berta, is scanning the covers and capturing some other data. As with the film, these are both preservation and access based-efforts that represent the early phases of longer-term projects now underway at the Historical Society. It is also a project very much driven by volunteer efforts. We have had a lot of help from our volunteers this year, for that we thank these dedicated people…….Gustie Bell, Alan Berta, Anne Blecksmith, Cal Drake, Beth Guynn, Skip Levi, Nicholas Lucero, Joel Montes De Oca, Margie Regan, Keith Ricks, Angie Roman, Gail Ryan, Tracey Schuster and we wish them and all of you a happy and healthy holiday season.